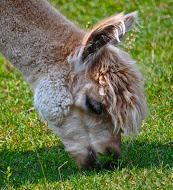 Hey everyone - thanks for checking in, and please forgive me for the lack of a post last week! The husband and I were enjoying a ski holiday at Alta, and I had a week long break from the kitchen. Of course, cooking could never be too far from my mind, so I read what turned out to be a fantastic new memoir on the flight: Blood, Bones and Butter by Gabrielle Hamilton, chef/owner of Prune in New York. In fact, my dueling-for-the-armrest, strange-man-nodding-off-in-my-personal-airspace, center-seat hell was barely noticeable; I was that absorbed in reading. When the wheels touched down in Salt Lake I was almost torn about closing the book and getting on with my vacation! It's not just that the subject matter was interesting; some of the writing shattered me - in a good way (and that's not something I ever thought I'd say about food writing, but this book is so much more). Anyway, I returned to Vermont jet-lagged and pleasantly muscle-weary, and all I could think about was eggplant; probably because much was made in the book about eggplant in Italy. I wanted something simple and fresh, but comforting and filling too. 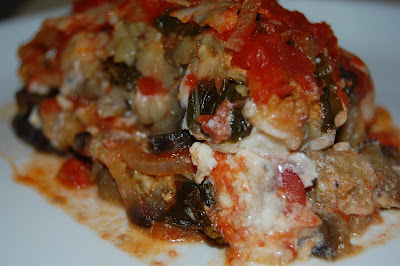 That's how I ended up with the following faux lasagna, in which eggplant slices replace pasta sheets. Although eggplant in casseroles is often breaded and fried, I opted to curb calories and make things easier by broiling slices instead. Peel eggplant fully or partially, depending on preference (I like to leave at least some peel for texture, color and flavor). Cut into 1/4 inch slices and toss slices with salt. Allow to drain in large colander one hour if possible. Saute onion and garlic in olive oil until well-softened, but not browned. Add tomatoes and their juices, breaking them up as you add them. 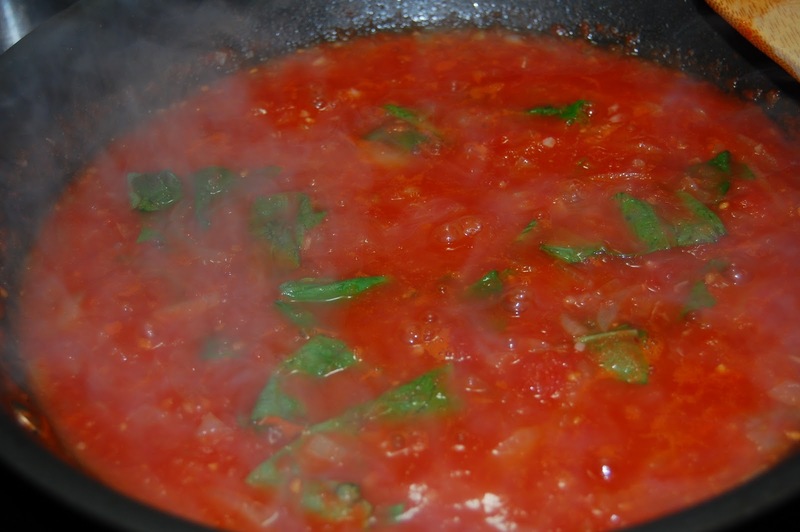 Shred basil leaves into 2 or 3 pieces each and add to taste. Add red pepper flakes. Simmer, uncovered, until thickened to a light sauce consistency. 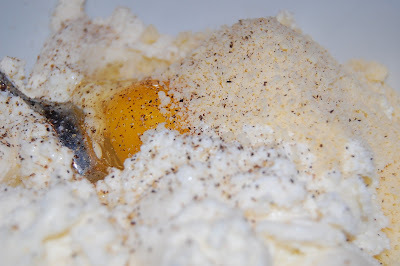 Check seasoning and add salt and pepper to taste. 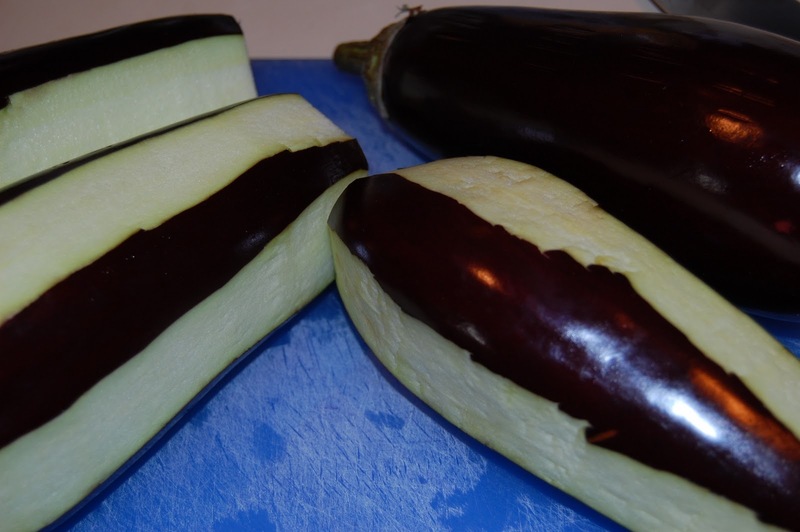 You want a well seasoned sauce to flavor the eggplant. Mix ricotta, egg, grated romano or parmesan cheese, and 1/2 cup grated mozzarella in bowl. Add salt and pepper. 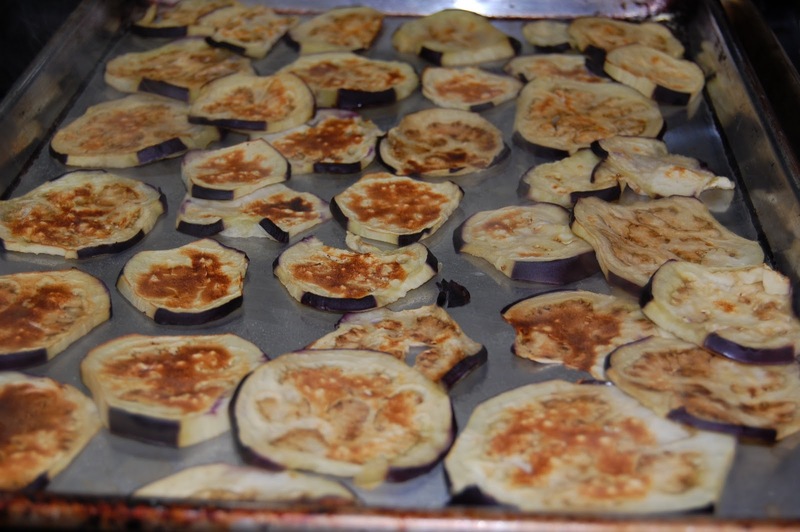 When eggplant has drained an hour, preheat oven to 400 degrees. Rinse eggplant slices lightly under running water, then squeeze a handful of slices at a time to wring out moisture. Lightly brush slices on one side with olive oil, place oiled side down in one layer on 2 sheet pans and brush tops with a little more oil. Place one sheet pan at a time under broiler and broil first side until lightly browned, then flip slices and broil second side briefly (watch carefully so it doesn't burn) - about 10 minutes total for each pan. Lightly oil a gratin dish or 9" square baking pan (I used an 11 x 8" oval gratin dish). Place 1/3 of eggplant on bottom. 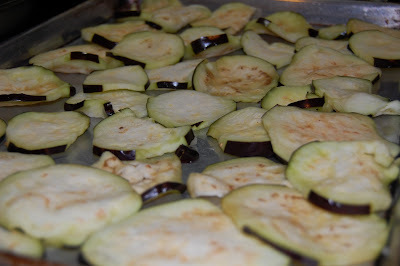 Place 1/2 of ricotta mixture over eggplant in large dollops. Top with 1/3 of tomato sauce, also placed in dollops. Repeat with another third of eggplant, pressing down to flatten ricotta layer; then add final ricotta layer and second third of sauce. Finally, place a third layer of eggplant, top with remaining sauce, and sprinkle with remaining grated mozzarella cheese. 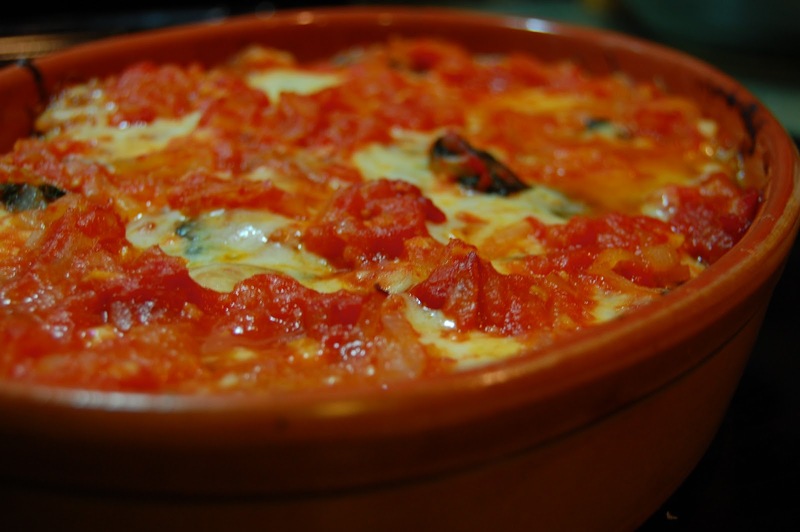 Bake about 45 minutes, or until mozzarella is melted and juices are bubbling. Remove from oven and set aside about 10 minutes to allow eggplant to absorb some of the juices. Oh my GOD this looks amazing. Think I can talk Susan into making this one too?? Tombo as he loves eggplant even more than I do. This was absolutely awesome! And the eggplant prep was so much better than the breaded and fried variety... As always, thanks for including so many great vegetarian recipes! Thanks K, L and "Anonymous!" Time to work, time to take responsibility for existing ones. Obat herbal untuk mengobati bronkitis kronis adalah dengan mengkonsumsi QnC Jelly Gamat sesuai aturan maka dalam jangka waktu yang efektif akan menyembuhkan penyakit bronkitis kronis Anda. if the way is now not managed to reach the ideals and desires. 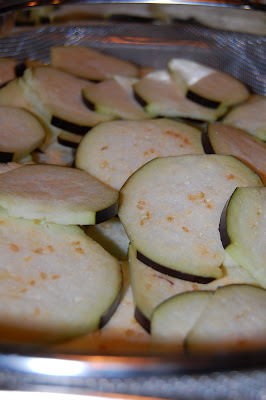 I ended up with the following faux lasagna, in which eggplant slices replace pasta sheets. hmm, good looking the amazing . Love your works. It is really simple to practice.